About two years ago, I wrote an article about how I added a Micro Four Thirds (MFT) system to my portfolio of photographic tools. So, after two years of experience, I thought it might be worthwhile to re-assess my original thoughts and assumptions. In essence, I am trying to answer the question “Is Micro Four Thirds good enough for me or not?”. I know that a lot of people are interested in using a smaller and lighter camera system. Therefore I will try to describe my experiences in working with my Olympus OM-D E-M1 as objective as possible. I realize that MFT is more than just Olympus, but for this article I would like to stick with Olympus, because this is what I have first-hand experience with. Disclaimer: I got the idea for this article when reading Thom Hogan’s Seven Reasons Why I’m Still a Nikon DSLR User. I found a lot of similarities, but also differences when comparing Thom’s findings with my own experiences. In the end, I decided to publish my personal impressions. Two years ago, the hype around mirrorless cameras was incredible. Mirrorless (or EVIL – Electronic Viewfinder Interchangeable Lens) cameras were thought to be the future of photography. And they did increase their market share, but not as much as expected. So, let’s have a look at the Micro Four Thirds advantages and disadvantages. In this area, my expectations are 100% fulfilled. I am now using a small instead of a large backpack, and its weight is less than half of what it was before. I am now able to pack a second body (an E-M5 converted to Infrared). Even my tripod got smaller and lighter. For city trips, I am using a small shoulder bag where I can pack my camera, 3 zoom lenses and a small flash. It is barely noticeable compared to my full-frame walk-around kit. If I need to go even lighter, I put the camera plus the 14-150 mm zoom in a waist bag. In the beginning, only the 12-40 mm PRO zoom lens was available. But Olympus did publish a road map and quickly filled the gaps. From all the mirrorless makers, Olympus probably offers the most complete set of lenses, including the “holy trinity”: the 7-14 mm, the 12-40 mm and the 40-150 mm f/2.8 PRO zoom lenses. Take these weather sealed PRO zooms, add the available prime lenses (usually f/1.8) plus the fish-eye plus the 300 mm PRO telephoto lens, and you have a remarkably complete lens set. Personally, I would like to see an 8 mm prime lens at f/2 or f/2.8 added to the mix. I would prefer it over the 7-14 mm zoom, because the zoom is actually large and heavy for a MFT lens and does not allow filters. Other than that, there is really nothing to complain about. Olympus was already known for high quality lenses, and they did not disappoint. The quality of the PRO lenses is as good as any lens from Canon or Nikon. With the primes, you might have to stop down the lens a little bit to get excellent results, but the same is true for wide aperture prime lenses of any brand. My personal favorite is the 75 mm f/1.8 prime lens, it has a gorgeous creamy bokeh. Note: I really wish Olympus would continue to publish lens road maps. For example, I would have waited for the new 12-100 mm PRO lens instead of buying the 14-150 mm lens. Knowing the sensor size, I was not expecting any miracles in terms of high ISO capabilities. Previously, I was using a Nikon D700, which is a perfect low-light camera. I had usually set my D700 on Auto-ISO, up to 3.200 ISO, without any issues. And I was not expecting the same from my E-M1. However, I found that the E-M1 is perfectly capable of shooting at higher ISO ratings. The noise is mostly luminance noise which you can easily remove, with very little chroma noise. If you look at the pictures I took at the Harley Davidson museum, most of them were taken at ISO 3.200. And it was really easy to remove the noise in Lightroom. I have to admit that personally I consider increased depth of field (DOF) as an advantage for my type of photography (landscape, macro, abstract). I do not shoot portraits or weddings, where you usually need a small DOF. Having said that, I have no problem taking pictures with a shallow depth of field with my E-M1. Again, look at the Harley Davidson museum pictures, and form your own opinion. I took the pictures with the 75 mm f/1.8 prime lens, using apertures between 1.8 and 4. On the other hand, the increased depth of field is a definite advantage for macro photography. If you look at the macro shots in the 2015 Pictures gallery, they are all taken with the 60 mm f/2.8 macro lens. You will agree that with this lens, balancing foreground sharpness and background blur is not difficult. Okay, here we have a bright side and a dark side. Let me start with the bright side: for mostly static or slowly moving objects, the autofocus system is perfect. It nails the focus precisely, and I would say it is equal to or even better than a DSLR. For macro photography, the touch focus system works very well, and I would like to see that feature in a DSLR. The dark side is that for fast or erratically moving objects, the AF system does not even come close to a even low end DSLR. The biggest problem is initial focus acquisition. Once the focus system has locked on to the subject, it is capable of tracking it as long as it does not move too erratically. I don’t even want to compare it to my new Nikon D500, which has currently one of the best available AF systems on the market. But even my 8 year old Nikon D300 performs significantly better in that area. And yes, I have tried all the possible combinations of continuous and tracking AF modes. The D300 wins hands-down. Focus Peaking: In fact, I found this feature so useful that most of the time I have my camera set to manual focus (MF). I feel that focusing manually in combination with focus peaking allows me to more precisely balance whether I want to put more emphasis on the foreground or on the background. Live Histogram / Live Over- and Underexposure display: This saves you from having to take a picture and look at the “blinkies” on your rear display. There is one thing you have to keep in mind if you shoot RAW. Don’t forget that the over- and underexposure display is based on the preview JPEG. So even if you see the over- or underexposure warning in the display, it does not necessarily mean that the RAW file is over- or underexposed. Reviewing pictures in the viewfinder: With my DSLR, I often had the problem that in bright sunlight, I could not clearly see the picture on the rear display of the camera. There are tools to work around that, like the HoodLoupe, but they are really inconvenient to use. With the E-M1, I just review the pictures in my viewfinder and can see them in full contrast. The slight delay between the reality and the viewfinder display is not an issue if you don’t shoot fast-moving action. For everything else, the additional value of an EVF is something I don’t want to miss in the future. Look at the rate and frequency of improvements. When was the last time you saw Nikon implementing a major new feature in firmware? The only thing I found really annoying was that with every major firmware update, the settings were reset to their default values. This was even more annoying as Olympus provides no way to save and load settings from a memory card, as most other camera makers do. Note: I got more features than I expected. The update process needs improvement, though. Yes, I know. Everyone tells you that battery life is an issue with mirrorless cameras. But I did’t think it would be so bad. With my Nikon D700 and a full battery, I was able to shoot for a whole weekend. A single spare battery was all I needed to be safe. With my Olympus E-M1, I use three to four batteries a day. Okay, the price for the spare batteries is not overwhelming. But you need a lot if you cannot charge them at least once a day. A connected issue is the battery charger. The original charger supplied by Olympus is something I would recommend to use only if you want to test your patience. The time it takes to charge a single battery is ridiculous. Instead, I am using a Watson Duo LCD Charger which is a lot quicker. In addition, it can charge two batteries at the same time (plus a USB device like your phone). It will also show you the charging level and you can use adapter plates to charge other batteries. That means you can for example charge an Olympus and a Nikon battery at the same time. Extremely convenient. No endorsement, just a satisfied user. I have to say that controlling the camera remotely works reasonably well. Basically all the options you can set on the rear display of your camera are available on your smartphone or tablet. Even autofocus works, which is extremely convenient if you would like to take pictures from unusual angles or perspectives. To connect the camera with the smart device, all you need to do is scan a barcode on the rear camera display. I find this solution very convenient. But again, there is a flip side. If you connect the camera and the smartphone via WiFi, it will drain your batteries. And I mean both the camera and the smartphone. Power consumption is much higher as usual. The first time I did try out the remote control feature, the battery of my smartphone was nearly empty after 45 minutes of playing around, and it was about 75% full when I started. The high power consumption is even noticeable when you don’t control the camera remotely, but just have the devices connected to use the smartphone for GPS data. I would really prefer having a dedicated GPS chip built into the camera instead of the permanent connection between the camera and the smartphone. In summary, this is a useful feature but the power consumption will not let you use it to its full potential. In the past, I was working in Lightroom with 36 MP (megapixel) images of my D800E. I know how these huge RAW files can slow down Lightroom, especially when compared to the slim 12 MP images of my D700. With that, I was really looking forward to the 16 MP pictures of the E-M1. But after importing the first few RAW pictures and working on them, I felt something is wrong. Working on 16 MP E-M1 files was not any faster than working on 36 MP D800E files. What is going on here? What does that mean? 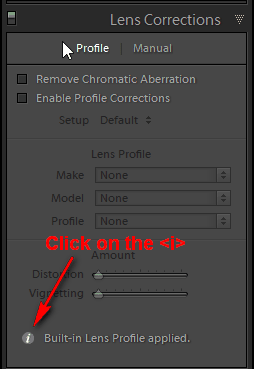 For every picture, Lightroom will automatically apply distortion correction and chromatic aberration correction. This is a very CPU intensive calculation and the primary reason for the slow-down when you work with MFT RAW files. Please note that this is not the case in case you shoos JPEGs. In this case, the corrections are applied in your camera. Compared to other RAW formats, you cannot disable the automatic correction of MFT RAW files in Lightroom. Adobe has confirmed this in a KB article about lens profile support. 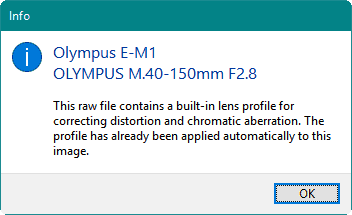 This is why you will not find any MFT lens profiles in the Lens Corrections section of Lightroom (and Photoshop). There is actually a good reason for this decision. Since MFT lenses have been designed for low weight and size, their uncorrected images can demonstrate quite significant distortion. A good example is here: Micro 4/3rds Photography: Geometric distortion correction. If you would like to see how your uncorrected MFT RAW files look like, you can view them on your computer using RawTherapee, an Open Source RAW development tool. Also, OpticalLimits (formerly known as photozone.de) usually shows the uncorrected distortion in their MFT Lens Tests. Anyway, the conclusion here is that you will probably need more computing power to work with MFT RAW files than you thought you would. For my Nikon RAW files, I usually enable distortion correction only for pictures I plan to publish. This makes a significant difference especially in the Lightroom Develop module. 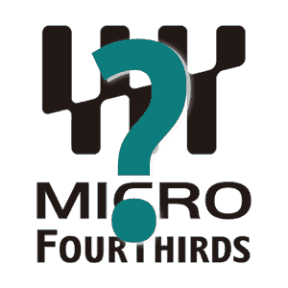 So – is Micro Four Thirds good enough? The short answer is: it depends. It really depends on your type of photography and your personal preferences. For me, the decision was to keep both my Nikon and my MFT systems, with each system tuned to the specific needs. I will keep using my Nikon system for any type of wildlife photography, especially for birds in flight. For everything else, I will use my MFT system: macro, landscape and travel photography. I can see how someone else, with different requirements, will come to a different conclusion. But then, isn’t it actually great that we have all these choices available? No matter what your photographic requirements are today, there are solutions out there. You may just have to look beyond the limitations of a specific system and broaden your approach. Keep in mind that these are my experiences and conclusions, and they will likely not apply to your situation. In no way I am suggesting you should go out and take action based on what I wrote here. All I wanted was to share my experience, so you can make better decisions. As I am writing this article, Olympus has just announced the successor to their flagship model, the OM-D E-M1 Mark II. On the paper, the specifications look impressive. But the same was true for the original E-M1. Just remember the marketing messages back in 2013, when the E-M1 was announced. And we should not forget that DSLRs also continue to improve their performance. So, at this point I am a bit skeptic about the new E-M1 Mark II. No doubts, it will be a great camera. And it will be another step closer to the ideal mirrorless camera. But perfect? Let’s wait and see. Until then, I will continue to use my two camera systems, depending on my needs. But what is your approach? I would love to hear your thoughts. Is Micro Four Thirds good enough for you? I have recently sold all my Nikon gear D500 and D750 and moved up from my EM1 to a Lumix G9. I can now carry all the lenses I need for a whole day without suffering fatigue. 20m pixels is enough for any screen and reasonably large prints. I have two sets of zooms the non pro Tamron 14-150 and Olympus 75-300 are nice and light while still giving good quality in good light. My pro zooms Olympus 12-100 f4 and Lumix 100-400 weigh a bit more but are so much lighter than than my old 150-600 Tamron. I have a bag of fast primes for low light work all of which are superb. I also have a Samyang 7.5mm Fisheye which is a dream to use with focus peaking. In low light I find that noise performance is good provided that the subject is in sharp focus. Out of focus areas seem to suffer more. I use DXO to process my RAW files and the Prime Noise reduction is superb for high ISO shots. I use Affinity for editing if required. Although the G9 is not a light camera, I find the handling to be absolutely superb. I tried a vertical grip but sent it back as the back button focus button is in the wrong place and the grip makes the camera too big and heavy. I did use a grip on my EM1 as I found it improved the handling. I really hope that MFT survives because it gives me everything I want from a camera system and I do not miss my Nikons at all. Thanks for sharing your thoughts here Jeff! I did look at the G9 as well, but decided to stay in the Olympus universe for now, but it is definitely a capable and tempting camera. The zoom lenses you use will do fine for every situation, except probably low light. This and the fast focus I still use my Nikon D500 for wildlife photography. I don’t think MFT is going anywhere, it is a strong system and pretty much the only choice if you want to go light and still take high quality pictures. It will be around for a while! i have been a photographer for over 60 years, now just short of 84 i find full frame and med format to heavy for my aging body,i bought a used omd m1 and also a olympus omd 10 mk 2 and find them very good for street photography portraits, and general photographer, i fact i took my 2 cameras to the coast recently, i live in u.k. and was very satified with their performance often seeming sharper than my larger cameras, i have 3 pro lenses and they are first class, however i used to be a sports photographer and my present outfit is not up to sport or wild life tracking, so its a matter of horses for courses. but at my time of life i have packed action photography in, i can recommend mft for most subjects. Thanks for the comment Donald, I fully agree on MFT performance. I am now working with two separate camera sets: a Nikon D500 with long lenses for wildlife and birding, and an Olympus OM-D E-M II for pretty much everything else. Why not use the best of both worlds? I changed to MFT years ago (panasonic). One thing that is always overlooked is flash performance. It still bothers me that when using TTL flash, every mirrorless camera has a significant shutterlag of half a second or so. This makes it impossible to do fast street photography with flash if you have to capture the right moment. Small MFT cameras are often recommended as ideal for street, but that’s incorrect if you use flash a lot. You definitely have a valid point, thanks for sharing this information. Have you ever compared the lag caused by the TTL flash between DSLR and mirrorless camera? Would you say there is a significant difference? And by the way, another thing with MFT is EVF lag. Just walk and point the camera at your feet and look through the EVF. An example in my case is that when I try to photograph walking people from the side, I try to catch the moment when their feet both hit the ground (legs are in an “A-shape”). This was easy to do with DSLR, but with MFT it’s very hard to get right. This of course goes for all somewhat fast moving subjects, like small animals etc. In my opinion these cameras are not really suited for fast run&gun photography, which I used to do a lot. Thank you for sharing the shutter lag observations, and for the link, it was interesting reading. You are right with the EVF lag, but I have to say that newer EVFs are definitely getting better in this regard. With my Olympus OM-D E-M1 II, the EVF lag is barely noticeable, and I know that this is not even best in class performance. If you have a chance, try out the new Sony mirrorless cameras, or the Panasonic G9 – I think you will be positively surprised. Yes, it could very well be that the EVF has improved during the years. I use somewhat older gear. The fastest EVF I have used was that of the Panasonic G6, but they seem to be better now. The shutter of my G6 died after only 31645 shutter actuations. and then then I went for a second hand GH3, slower EVF but hopefully better shutter. As relative prices have gone up for most state of the art MFT gear I will not be upgrading soon. Especially not if the shutter dies too soon on budget models. I have owned an EM1 with the Pro zoom lenses for 4 years and whilst admitting to a degree of brand loyalty have been completely satisfied with the weight (and price!) to quality ratio. On the matter of resolution, the largest enlargements I have made are 20 x 16 at 800 ISO, but when sensor size is discussed I have never heard ay mention of the fact that the greater the enlargement, the farther one has to stand away to view it properly. Is there not a diminished return situation here? One does not view Turner’s Fighting Temeraire from 3 feet! Well, there is a rule of thumb out there saying that most people consider it comfortable looking at a print from about 1.5x to 2x its diagonal length, unless you are examining details (for example at http://www.northlight-images.co.uk/what-print-resolution-works-for-what-viewing-distance/). Size and resolution of a camera sensor are important to calculate the depth-of-field for an image (for example at https://www.cambridgeincolour.com/tutorials/dof-calculator.htm)and then the resolution of your output for a certain print size (for example at https://www.cambridgeincolour.com/tutorials/digital-photo-enlargement.htm#calculator). Many thanks for your prompt reply and acceptance of my notes. I speak as a keen amateur and who does not want to carry any more weight than necessary to achieve good results and I do appreciate that the greater depth of field when shooting in MFT needs careful handling. I will not be changing, and probably expanding, my MFT system but the links you have kindly provided will make for interesting reading. Hello Douglas, I believe you had a perfectly valid question. I am sure there are many other people who would like to achieve the best possible results when printing / enlarging their pictures. But based on personal experience, let me warn you: this is an addictive topic. The more you start reading about it, the more you get confused – at first. But it is worth exploring, for sure. Have fun reading! Hi Matt, thanks for posting this very interesting question. Since image quality is a very subjective topic, I don’t think there is a single right answer, but let me add a few comments and thoughts. Right now, I believe there is always a compromise between resolution (because it seems this is what you are primarily after) on one side and size and weight on the other side. MFT cameras are currently limited to 20 MP, so I don’t believe they are the primary choice for landscape photographers. But it really depends on your personal priorities. If resolution is your ultimate goal, you will have to carry a heavy bag. If size and weight are more important, a MFT camera might do the job for you. Why don’t you borrow one of the newer MFT cameras next time you go out on a shoot and do a side-by-side comparison? Ultimately only a direct comparison will give you the confidence to know you are working with the best tool for your requirements. 20×30 is no problem for mFT! You will not see any difference in comparison to an image taken with a 36MP-fullframe camera!! In my experience a mFT-camera ist the ideal tool also for landscape-photography, because your equipment is of handy size and reduced wight, what is very important when traveling around and on hiking tours. Hi Matt, I have no doubts that MFT might be good enough for some of us. But to be fair, there are also people who will certainly appreciate higher resolutions. They may shoot for magazines, billboards or stock agencies. Heck, I know people doing landscape photography using 8″x10″ large format slide film, and they have no issue lugging their gear around. We just have to realize that “good enough” has different meanings for different people. And that is by no means a bad thing at all. I’ve certainly had no issues with MFT and image libraries like Getty and Alamy, all I would say is take time over your composition as you can’t afford to do much cropping. Thank you Floyd for this insight, I find it very useful. Too many people believe that their pictures will not qualify for the bigger stock agencies because of the (perceived) lower resolution of MFT cameras. It is good to know that you have no issues submitting your pictures. It’s working great for my architectural and landscape photography, and for low light candid photos at parties, low light group photos (often candids at parties), and for environmental portraits. The extra DOF is helpful for these things, which is one reason I changed to M4/3. The only time I find it lacking is when I occasionally want to do photograph using shallow DOF. I can usually achieve shallow DOF, but it’s sometimes challenging to do so. However 95% of what I do requires deep DOF. So M4/3 is good with me. Glad to hear about your positive experience Charles. You are right, usually the extra DOF provided by the smaller sensor is helpful. If a more shallow DOF is required, I can personally recommend the 75mm f/1.8 lens, and there is also the Voigtlander Nokton series with their f/0.95 aperture MF primes. An let’s not forget that Olympus is just about to extend their Pro series lenses with three f/1.2 primes. Robert, This is an excellent article, and one I find relevant even half a year after you published. I am also an advanced amateur in the sense that I do not earn a living from photography. I am retired from another field, but I shoot sports for a Division 1 college in my hometown, and I have left the DSLR world behind. I use Olympus bodies and lenses, and Fuji bodies and lenses. I bought the E-M1 Mk II as soon as I could, and have no regrets. I compete head-to-head with several guys who use Nikon bodies and lenses, and produce results which are as good as theirs. When I go on the road with the various teams, I find a great deal of interest in my gear, and I answer a lot of questions. MANY of the folks who question me about my experience seem convinced that the “handwriting is on the wall” but they are loath to absorb the expense of selling their glass at a loss in order to switch. I understand that; I simply had to accept the fact of the expense of change, and then the move was an easy matter. In my case, I even had to part with my beloved Leica R bodies and lenses, as well as the Nikon bodies and lenses, in order to lower the cost of the move. I could not be more pleased at this point. One item which you have not mentioned in your analysis is that I rely heavily upon the EVF of the mirrorless cameras to eliminate the need to chimp after shots. I know as I press the shutter what I have recorded, in terms of exposure, and decisive moment. The design of the DSLR prevents that from happening. Hello Joel, thank you for the kind remark and for sharing your personal experience with MFT gear. Like you, I have already upgraded to the E-M1 Mk.II, but I find it too early to draw conclusions, tbh. Would you mind sharing your impression about the AF system, especially regarding tracking objects in either CAF or tracking mode? I found the E-M1 lacking in this area and would like to understand what you think of the new AF system in comparison. I also get a lot of questions about my MFT gear – in the beginning, people didn’t take MFT serious, but now I get very specific questions about how things work, compared to a DSLR. I know quite a few people switching over to Olympus. Some of them were shooting Nikon for their whole life. Most told me it is because of the weight. You are right about no longer having to review pictures immediately after taking them, I am glad you mentioned it. I’m on the verge of buying into MFT System – but since I also do weddings, Portraits, Football and high iso stuff, I definately need my full frame DSLR Equipment. And adding MFT is not cheap. Every time I’m very close to pull the trigger I think: Do I really need it? With the Money I can get some more primes for my DSLR which might be good enough for a travel Equipment and I can use them for several other things I mentioned above. Because if I buy into MFT i Need at least the 2.8 lenses to be happy. I don’t like variable f-numbers even on my FF Equipment, so it’s definately a Money Thing. As for your Review, I think you did a great Job in being honest about everything. I bet it is really a good System and I fear not of the ISO stuff talked about on message boards. It will be good enough. Thank you Simon for the insight. I agree that with your current situation, adding MFT would not make a lot of sense. The way I did finance my MFT system was to sell my full frame camera together with the f/2.8 lens set and replace it with a lighter DX body with only the lenses I need for wildlife. It was not exactly a zero-sum game, but it helped a lot.